Pensacola State College has been well-represented in the NCAA Final Four basketball tourney during March Madness. One of the Pirates’ own – Hassani Gravett – is now a guard for the University of South Carolina Gamecocks. The No. 7 ranked Gamecocks will face No.1 Gonzaga at 5:09 p.m. Saturday, April 1, in Glendale, Arizona. The winner of that matchup will play Oregon or North Carolina for the national championship on Monday, April 3. Gravett, who played with the Pirates during the 2015-16 season, is only the second Pirates to make it to the Final Four. Former University of Florida basketball player Brett Swanson was a member of Florida’s back-to-back national championship teams in 2006 and 2007. While at Pensacola State, the 6-foot 1-inch Gravett was named the Panhandle Conference Player of the Year – despite only playing in 12 games due to ankle sprains. He still averaged 16 points, 7 rebounds and 3 assists per game while shooting 41 percent from the floor, 39 percent from three-point range and 86 percent from the line. Gravett is from the Atlanta area and was the Georgia 4A Player of the Year during his senior year at Alexander High School. When he signed his South Carolina letter of intent in April 2016, Gravett said playing in the SEC was a dream come true. 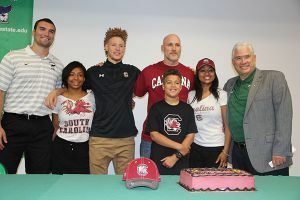 “I’m pretty excited to be headed to USC, but I’ve got to thank Pensacola State for preparing me,” said the then 19-year-old who has been playing basketball since he could walk. At the signing, Coach Pena described Gravett as a rare talent who has a high ceiling. “I’m proud of the work ethic that has allowed him a tremendous opportunity to play in the SEC,” Pena said.